We had just missed the 11:30 ferry and the next one was only at 3pm. We could take a fast motor boat but the fare went from VND80k (USD3.5) to VND266k USD11.5) per person. The price was significantly more but it was outweighed by the discomfort of sitting in a windy and chilly waiting area for 3 hours. We set off in an open speedboat kitted out in life jackets and wrapped up against the wind. We arrived in less than 20 minutes and were met by a taxi driver who seemed pleased to tell us that the next bus was at 4pm! But he’d do the trip for VND115k (USD5) per person – so for the sake of expediency we’d been fleeced again!! Cat Ba is a large island situated in Lan Ha bay adjacent to Halong Bay. We’d arrived at the northern end about 30 kilometres from the town which is situated on the southern tip. Depending on how you look at it the town is either eclectic or a mixture of clashing styles. Ranging from bland and uninteresting to quite architectural. Most narrow and tall. Many are virtually sunk into the cliff face. There is hotel after hotel, hostel after hostel, restaurant after restaurant, travel agent after travel agent. Many offering hire services for motor bikes or scooters. The peak season which is mainly Vietnamese visitors is in the summer vacation months of June and July. The rest of the year there is mainly western foreigners. This area doesn’t attract many Chinese or Koreans so there are many empty spaces and not much traffic. We stayed in a simple, spacious room for $12 a night including a simple single course breakfast. It was great value for money. It is a family run business. They are on call day and night and are very obliging. 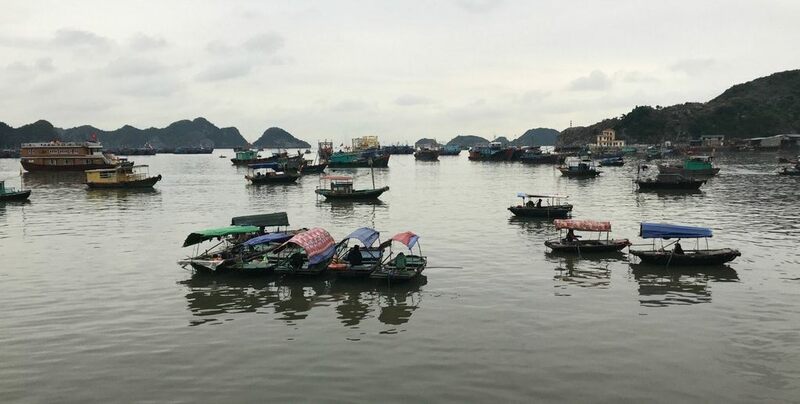 We returned to the Gia Luan ferry terminal by public bus and slow ferry at more than double the time but at less than half the cost of getting from there. While in Cat Ba we did some sightseeing and a hike. Close to town there is a steep walk up to Cannon Fort where you get stunning views of the islands of Lan Ha Bay. The views of sunset must be fantastic but as our days continued to be grey, overcast and cold we had to leave this to our imagination … and other people’s photos! At Cannon Fort there is a planned walk. You wander through the tunnels and passages that were used in various conflicts with the French and Americans. There is also a very basic museum. The next day we did the hike across the Cat Ba National Park. We made a booking with Mr Pineapple at the Pineapple Resort. A total of 15 kilometres split into 10 of tough hiking followed by lunch and then an easy 5k from the village to the port. There a ferry to take us back to Cat Ba town. If you are going to the north of Vietnam Cat Ba is a must visit if you enjoy hiking, mountain biking, climbing and some respite from the traffic and tourists. It’s a rugged island with an interesting town. Islands around with white sand beaches.